By now, we’ve all heard of the LWD (Little White Dress), this Spring’s alternative to the Little Black Dress. But after a recent review of my wardrobe, I realized I needed a LWS, (Little White Shirt) in the worst way. Scary fact – – I have a million tees and more than a million dresses in my closet, but hardly any shirts. Why? Because I sew without a plan. 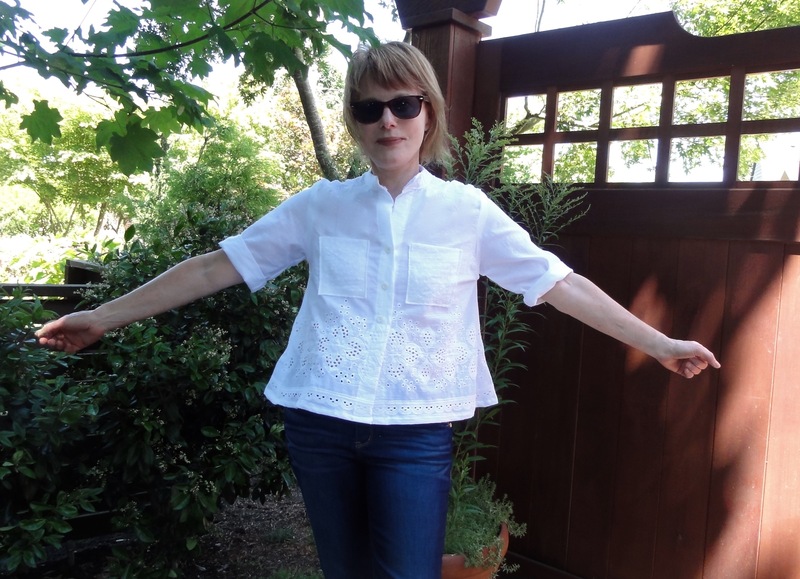 My sewing is inspired by many things: cool fabric, impulse buys, a great project I saw on someone else’s blog, an Ready-To-Wear item that I’m determined to ’sew for less’. But need? Never, a fact that has consequences. My wardrobe is a bit of a mash up. What to do? Sew! 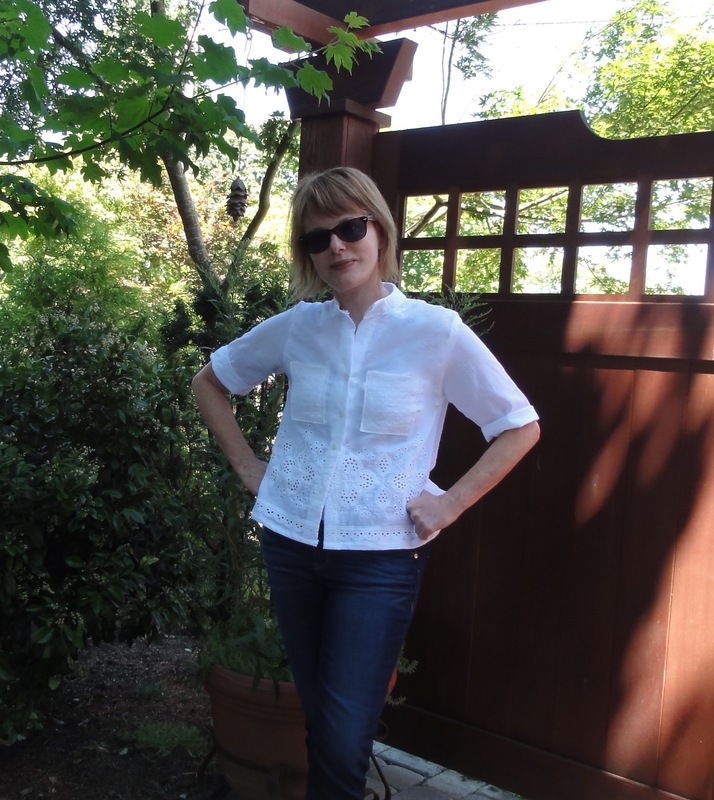 Given the fact that the temperatures are well above 90 degrees, I decided to use some very lightweight embroidered cotton in my stash to make a summer-friendly, white shirt that would work with a pair of shorts I never wear because they’re separates without a match. 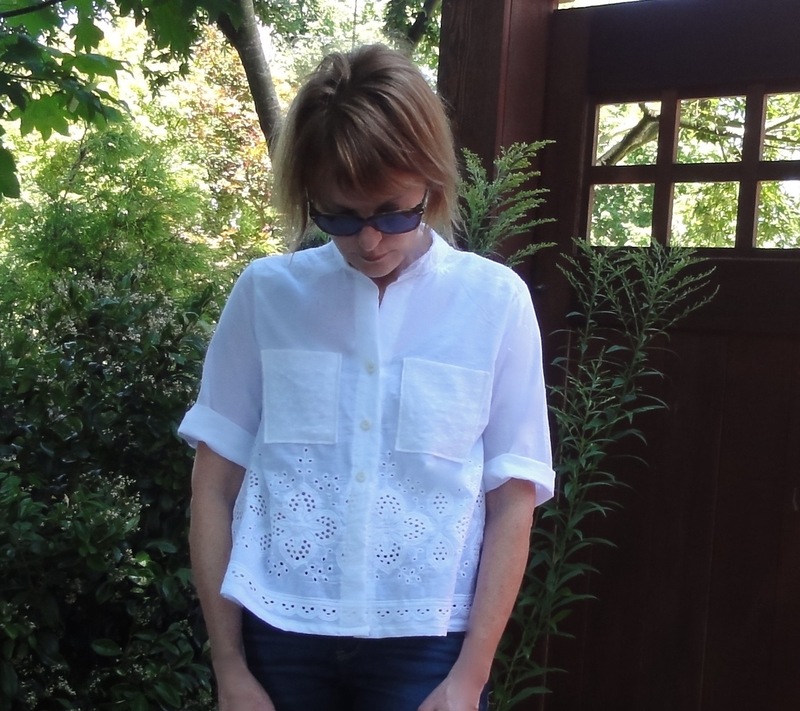 I chose an embroidered, lightweight cotton from my stash that I found at Fabric Depot. As usual, when I found this fabric, I made an Impulse-Buy. So, I didn’t have quite enough to make what I really wanted, a shirt with rolled-up sleeves and tabs. Also, the fabric’s cool embroidery detail is on the fabric’s border, so laying out the pattern was a bit tricky (similar to the issue I had with my kimono), and I used more than I meant to. So, I was forced to use a different fabric for the yoke and pockets. 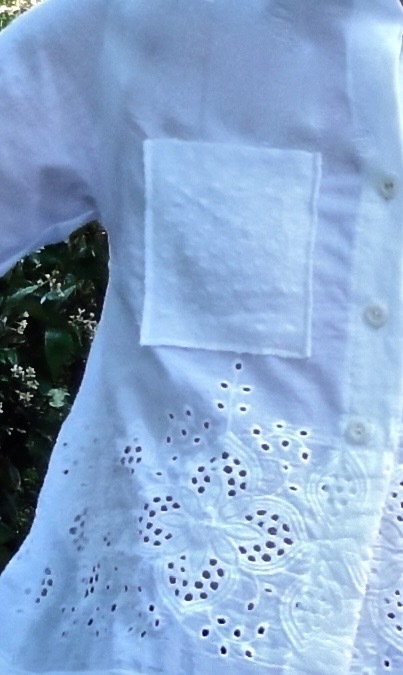 I had a bit of white textured cotton, a remnant left over from another project, so I used that. In hindsight, having too little fabric might have been a good problem to have, because the textured cotton makes the pockets stand out a bit more. 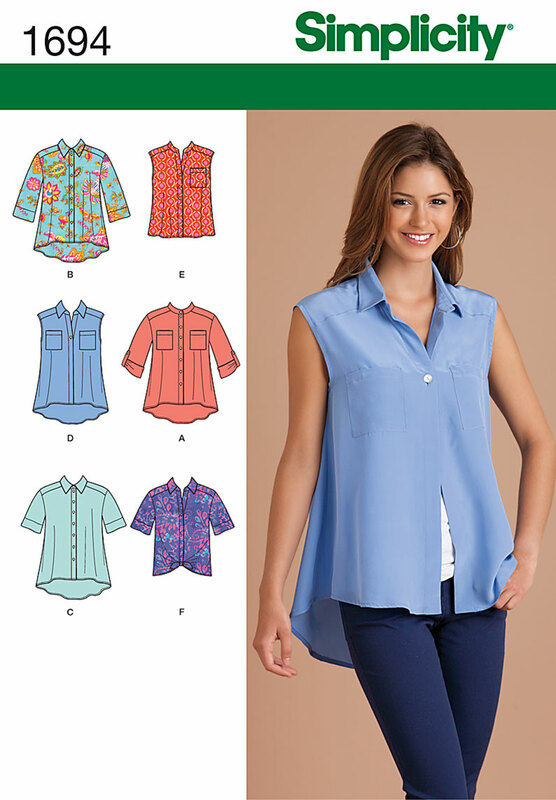 The pattern: Simplicity 1694, a loose-fitting button down shirt with sleeve variations, collar variations and length variations. It was pretty easy to sew and the instructions were very clear. The fabric: Lightweight cotton with a very wide embroidered border. I used vintage buttons I had in my stash. Modifications: None! For once, it fit without any adjustments or changes. The sleeves are 3/4 length, but I rolled them up for the photos because it’s so hot outside. I think this pattern will become a Tried and True. I’d like to make it again, a longer version that can be tucked in, maybe in chambray with long sleeves. Do you sew to fill a need in your wardrobe, or are you a bit random about the whole thing? Stay Cool! Thanks for stopping by. I loved your embroidered fabric right away! Got to have some holes in your shirt when it is 90 degrees! Very nice!